As anyone who’s read even a few articles on this site will know, my cat Avery is one of the laziest cats in all the land. Getting him to play at all is not at all an easy feat – let alone getting him to engage in exercise-intensive playtime sessions on the daily. 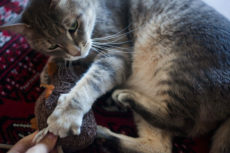 I’m doing my best to find a variety of cat toys that he likes so that when he’s in one of these uber-picky, lazy moods, I’ll hopefully be able to pull out a very old toy he’s liked in the past from the back of the cat toy drawer. My thinking goes that if I have enough toys Avery’s happy with in the rotation, he won’t be so difficult to engage in playtime anymore. But while this theory seems to be working out quite well some days, others, exercise during playtime just isn’t happening, and so I like him to get in a kitty cat work out regardless, essentially as back up exercise time to make up for days playtime just isn’t going to happen. How do I get my cat to exercise with zero effort on my part, even from a cat who’s notorious for his laziness? The answer is in the kibble. I currently have Avery eating two main meals each day with plenty of snacks between (I never worry about weight issues since I use this easy trick to prevent overfeeding with him). His first meal is at 8 AM, and his second/last meal of the day is at 10 PM. Right before these two feeding times, he’s especially hungry since I never give him food when we’re sleeping and I typically don’t give him all that many snacks past 1-2 PM. I hold a piece of kibble in my hand, making sure Avery knows it’s there (if he’s not convinced I have kibble, I let him sniff my hand for evidence). 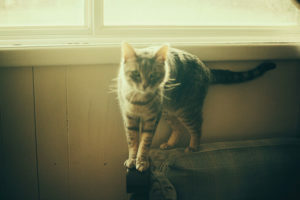 I find a chair or a dresser that he can jump up onto easily and safely. I place the kibble either on top of the dresser (audibly so that Avery can hear it’s been dropped), or I hold the kibble in my hand over the dresser so that he can eat the kibble out of my hand. Either way works. I wait for Avery to jump up and eat the kibble. I then find a second spot, a bed or sofa, a different chair or another dresser, then again either drop a piece of kibble or hold my hand over the spot for Avery to eat from my hand. I wait for my cat to jump up on this second object and eat the kibble. Rinse and repeat, taking him back and forth between the two objects he has to jump onto until I’m happy he’s had enough exercise, at which point I end the workout session. For more intensive work out sessions, I choose spots kitty has to jump multiple times to reach. For example, a high dresser where Avery has to first jump onto a sofa, then onto the back of the sofa, and then finally onto the high dresser in order to at last be able to reach the kibble. 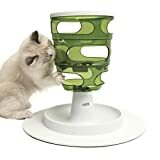 Interested in trying this, but can’t think of anything in your home kitty can jump up on? Pull out two dining room chairs and spread them somewhat far apart. 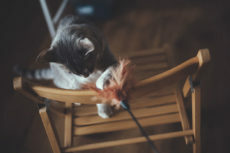 Don’t keep them too close or your cat will (cleverly) try to jump from one to the other, which is decent exercise, but for a proper workout, you’ll want to make the chairs far enough so that your cat will have to jump on the floor first, then jump up onto the second chair. Not sure when to stop? You can either have a set number of times you do this, or, like me, stop when your kitty looks like he’s getting a little bit slow about his jumping. 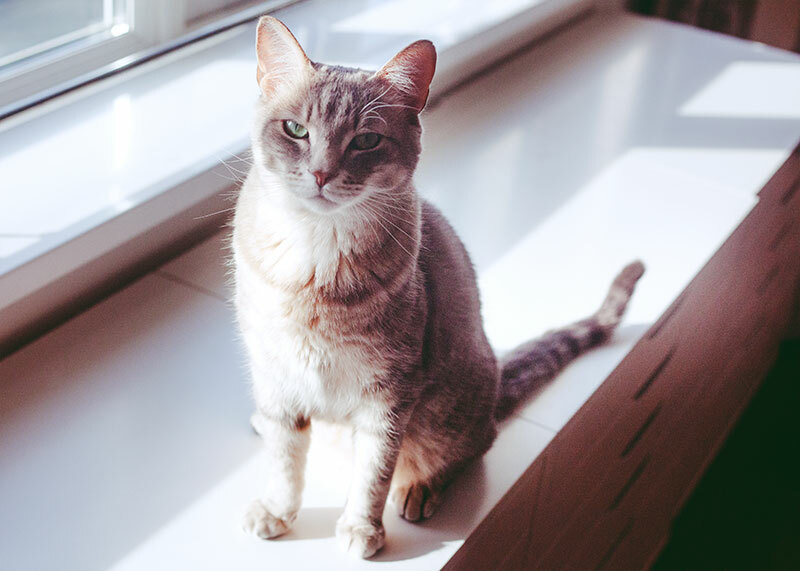 Your cat will slow down considerably at the point when the workout’s pretty much tired him out. After enough working out, I pour the remainder of the kibble for Avery’s meal into the Catit Senses Food Maze (reviewed here) and leave my cat to finish off eating in peace. I do find that the workout sessions contribute to him eating a little slower (though of course the food maze does wonders for that as well). Makes sense, since during the workout sessions, he’s being given a slow, steady drip of kibble, so when he finally gets to his meal, he already has something in his belly (and isn’t feeling like he’s “starving,” thus having to hurry to get something in his system). Some days I’ll make Avery get a single work out session in, others I’ll have him do two short ones, one before each meal, and others yet (on days he’s been playing quite well), I’ll forget about having him workout altogether. Regardless, he does get quality exercise this way, and it’s an excellent backup for when he isn’t happy to engage during playtime. Will This Cat Workout Technique Work for Every Cat? Cats who are not motivated by eating & by food. I’ve never met a cat in person who isn’t motivated by food at all, but I know they exist! 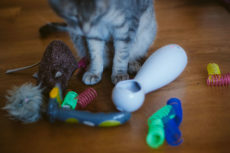 If your cat doesn’t care too much about feeding toys, chances are this exercise/workout routine won’t work for your cat. Without food motivation, your cat’s just not going to bother jumping to get the food from you. He or she will likely just wait patiently for his/her crazy people to put their meal down. Cats who are free fed/not fed meals. If your cat is free fed there is absolutely no way kibble for dinner is going to motivate him/her. Why should he/she jump from one spot to another to get food when there’s a bowl over there that he/she can chow down on whenever the fancy strikes? If you’re concerned your cat isn’t getting enough exercise and you free feed, try having set meals instead of free feeding. Don’t worry, snacks all throughout the day are perfectly fine, just follow this technique so you never risk overfeeding, and at the same time, never have to hold back with snacks. As far as I can see, there are no downsides to using this technique to get kitty to exercise when you feel exercise is lacking. You don’t need much; every house has at least two dining chairs in it, so you can use the technique without having to buy anything besides kibble. Any cat who’s motivated by food (which is most of them) and who is able to be fed meals instead of being free fed (again, most cats), I’d imagine would be happy to contribute to this workout. It makes exercise easy for a pet parent, and you don’t have to do it at all on days where you feel your cat’s got enough exercise as is. The only thing I would mention is that using this technique is definitely not enough to get your cat’s weight down. I’ve found that when it comes to weight loss – human or animal – it comes down a lot more to diet than it does to excise. Looked up a cat workout technique so that you could help an overweight cat lose weight? Sadly, while you may feel this will help, it likely will not. What you need is a diet that both you and your cat are happy with. 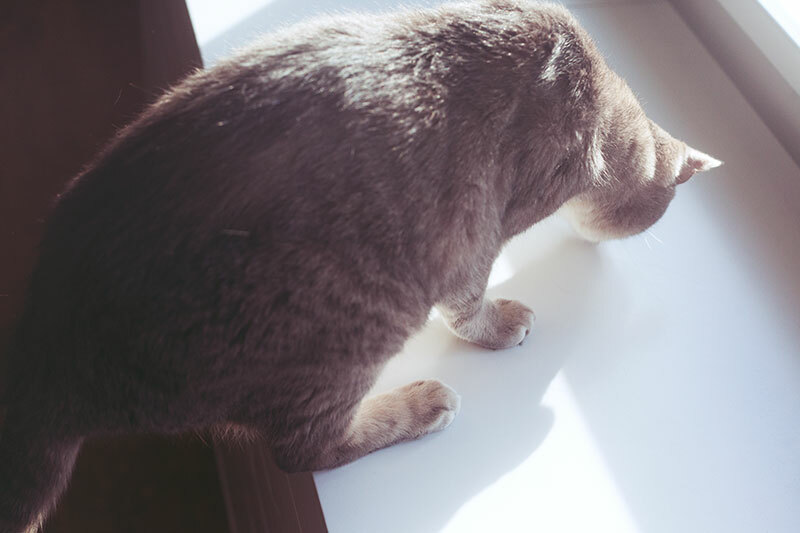 I’d use this trick to prevent overfeeding + a steady supply of cat-friendly, low-calorie snacks like lettuce to tackle weight issues. 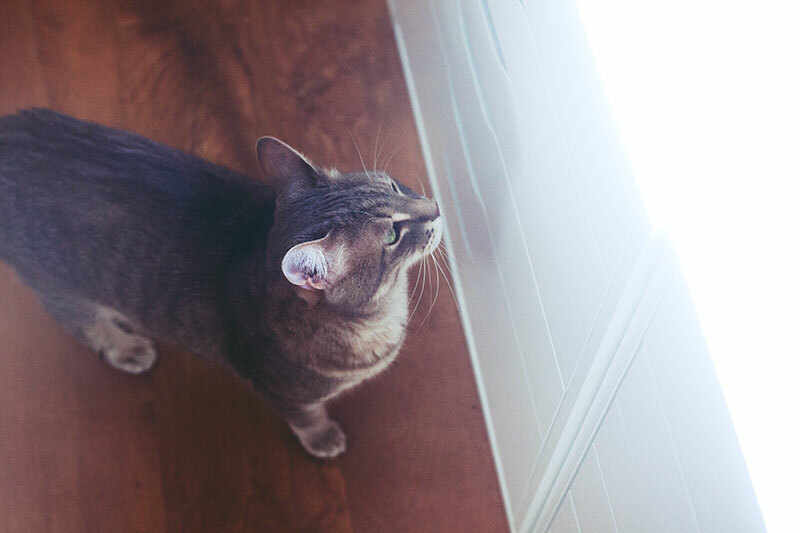 Bring exercise to the table when exercise is needed, not when a cat needs to lose weight. I’ve known a lot of cats who are so good with playing, and get a lot of exercise running all about a house, and yet have put on a few extra pounds. 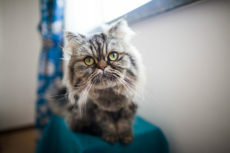 Will more exercise help these cats lose weight? Not likely, but a diet will certainly go a long way. And then you have my cat, who has never been overweight, but who is basically a sleep aficionado and a passionate snuggler who cares little for anything to do with intense exertion. He’s, in my opinion, the perfect candidate for cat workouts, because he’d otherwise not be getting much physical activity. Certainly, Avery’s not one to run and play on his own! Lazy Avery and other cats like him are what I consider to be the perfect cats to implement this workout technique on. If your cat just isn’t getting much exercise: that’s where this workout regimen begins to be important, at least the way I see it. 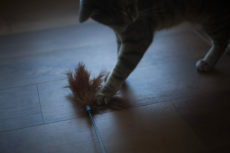 Looking for More Ways to Get Your Cat to Exercise? 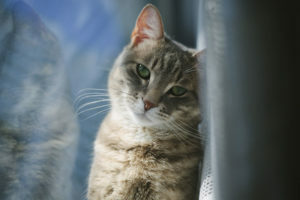 Take a look at this article here for more ideas on how to keep cats exercising – some which require an active time investment on your part, others which only require you to change something about your cat’s environment to make sure he or she will have plenty of passive exercise throughout the day with no interaction from you. 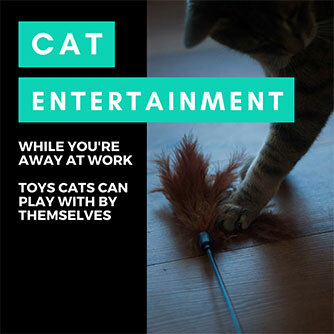 Looking in particular for toys your cat will engage with more often? 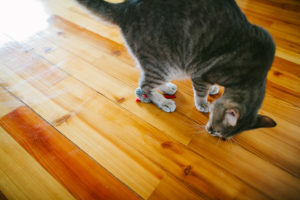 Check out my article on cat exercise toys you can try to help keep your kitty moving. Have You Ever Gotten Your Cat To Do a Workout? Have you ever done something similar, gotten your cat to do a workout? Did you do things the same way or do you have your own techniques? 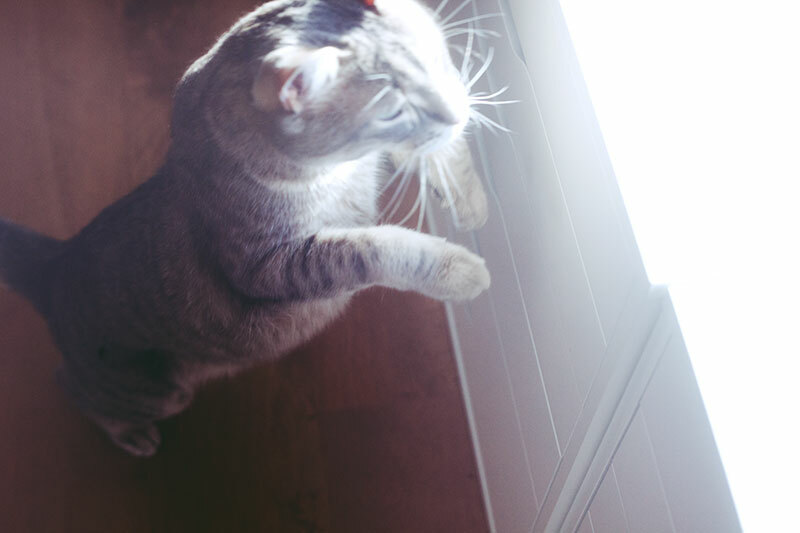 Ever thought your cat might need an exercise workout or even a workout routine? Think you might give this a try? Let me know your thoughts in the comments section down below! My kitty Creampuff and I developed a workout for her. She was impatient while I prepared her meals, which mixed wet and dry food, and the wet food always warmed to at least room temp. So I would toss kibbles past her, and she would run to get them – in the hallway or the adjoining room. It was part of a rather complex meal ritual that I, certainly, loved. I miss her dearly. Although mine are free fed kibble, certain brands of crunchy cat treats are highly sought after by the cats, and work in this type of feeding situation. 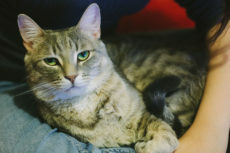 OH, I adore Avery, and I am that sort of kitty, too, loving and affectionate and rubbing on mama and papa whenever possibly or stretching out my paws and opening the ‘fingers’ with pleasure. But, now mama is going to make me EXERCISE!!! NO matter, these are great exercise ploys and I’ll pretend I didn’t read the instructions and just jump around enjoying my kibble prizes. Thank you for a great suggestion for lazy kitties like me. 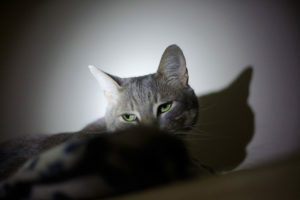 Are Cats Nocturnal? 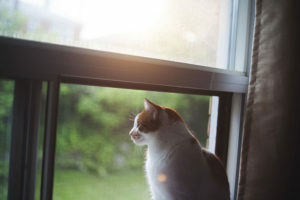 Do Indoor/Outdoor Cats Have Different Sleep Rhythms?